A lesson in the meaning of relational horsemanship…. The other day at the Ranch a couple of women, both of them riding instructors at a local, private barn, came to look at a pony for their lesson string. They only allow their ponies and horses to be ridden a couple of times a day, so it’s not like a major public boarding barn where the poor lesson horses do lessons and trail rides all day long. The Ranch is very particular about where we allow our horses to find their new homes. 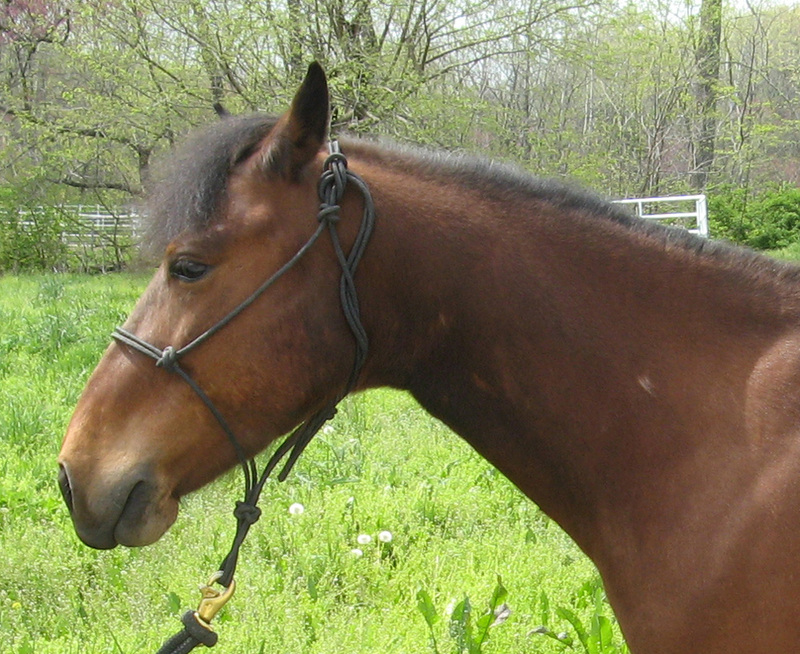 I had been doing paperwork and was walking across the aisle to the office when Jay hollered, “You want to ride Dugan?” The riding instructors were looking at “Dugan,” a pretty little Connemara pony who is as stubborn as the day is long. I was caught completely by surprise. “Sure,” I yelled back reflexively, and immediately started quaking in my boots. I’ve ridden Dugan before—he and I actually got along pretty well. He’s smart and well trained and, once he’s convinced you will follow through on your requests, is a fun little guy. It wasn’t that I was afraid to ride him. I was afraid to ride him with an audience. And of course there’s the general fear I still have of getting on a horse, the one that goes away once I’m in the saddle. The instructors had already saddled him up and were in the process of putting on his bridle when I got to the arena with my helmet. I suggested they take the bridle off because I wanted to move him around some before I got on him. They looked at me blankly. Dugan hasn’t been ridden much in the past few months, and I haven’t ridden him in over a year, so I sure as heck wasn’t going to hop on without checking out his mood first. So I did. I probably should have spoken up and had them take the bridle off, but I didn’t. I was too cowed. I walked Dugan out into the arena and put him through his paces. I moved his front end, I moved his hind end, I got him to trot around me in a circle, I had him do lateral work against the wall at a pretty good clip. I did everything that one would expect—all the things I’ve been taught. But even in the moment, I knew something was all wrong. The thing is, I feel sorry for Dugan. While the techniques I used may have been correct, the intention behind them was not. I was doing “natural horsemanship,” but this was not relational horsemanship by any stretch of the imagination. Replaying that interaction in my mind’s eye, I cringe. Going in, my preconceived idea was that this was a stubborn little pony who needed to mind. I was rough with him, I was abrupt with him. I didn’t give him a chance to respond to me. I didn’t give him time to actually do willingly what I was asking him to do: I made him do it. My mindset was to make the horse do it, to make him obey. In that moment I turned into Arthur, my father, and that’s not something I’m proud of. I wasn’t able in the moment to get out of my own head. A true relational horsewoman would have focused not on the actions but on the relationship, on that sense of partnership with the horse, and I was not able to do that. Shame on me. I got the job done, but it wasn’t pretty. And more than that, it wasn’t right. It didn’t do justice to that little horse, who deserves better. In my defense, I did have not one but two riding instructors who thought I was nuts, and “God himself” in the form of my mentor Jay, watching. Still, I wish I had been able to stop worrying about being judged. That makes me really sad. My apologies to Dugan. Hopefully, the next time I’ll be able to do a better job. I guess the first step in changing something is becoming aware of it. Well, I’m now aware, and embarrassed, and determined to do things differently.